Sunday: Mostly cloudy, spot shower. Highs in the 50s to near 60. Sunday Night: Mostly cloudy. Lows in the 50s and 60s. Monday: Mostly cloudy, afternoon showers. Breezy. Highs in the 60s to near 70. 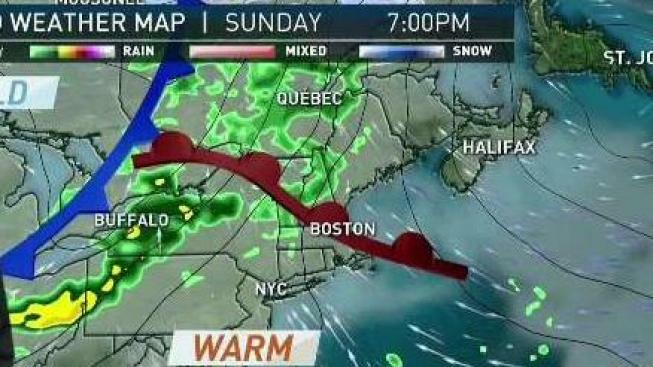 A powerful storm is tracking west and north of New England on Sunday. Storms that track west of us usually have a wind from the southwest and temperatures warm up, which is what is gradually happening Sunday. The wind up high in the sky is from the southwest, but the wind down near the ground is more from the east and southeast, eventually coming from the south. This low level air off of the ocean is somewhat cool, but will gradually warm Sunday afternoon and overnight into Monday. It's a cloudy day, thanks to a warm front passing over New England. We also have a spot shower with temperatures topping out 50 degrees north and close to 60 degrees south. At the same time to our west, from Illinois to Ohio and Pennsylvania, strong to severe thunderstorms are happening Sunday afternoon. These storms are the leading edge of colder air that will move in Monday night. Ahead of that cold front, temperatures will stay well above normal with lows near 60 degrees Sunday night, and highs Monday near 70 degrees. Showers and possibly a thunderstorm will accompany that weakening front, here on Monday. The period of rain should last about an hour or two, crossing from northwest to southeast through the day. Localized rainfall amounts of a quarter to a half inch are possible, but most of us likely get about a tenth. Colder wind arrives Monday night under a clearing sky, with low temperature in the 30s north and 40s south early Tuesday. High pressure from southern Canada would dominate mostly dry air and fairly chilly temperatures, for most of the rest of the week. Daytime highs generally in the 40s, and nighttime lows generally in the 20s and 30s. The temperature gradient between wintry chill in Canada and pretty warm air near The Gulf of Mexico is fairly high stakes for forecasting errors toward the weekend and next week. At this time it looks like northern cold will stay disconnected from the southern moisture and energy supply. So any storms this week should miss to the north and to the south. But we cannot let our eye off the pattern for even a minute, as it's a delicate balance with no big storms but the bust potential is fairly high.